Getting around Cambodia used to be a challenge, but the arrival of ride hailing companies has made it a lot easier to travel independently. Grab is the uber of South East Asia, offering ride hail services and has arrived in Siem Reap and Phnom Penh, Cambodia! Find out how to get from Phnom Penh airport or Siem Reap airport to the city or to use around town. I’ll point out some unique features, some of the differences to uber and alternatives to grab! Going anywhere in Phnom Penh or Siem Reap used to require pain-staking negotiations for every ride and the risk certainty for tourists to be overcharged. Thankfully, the arrival of a number of local and international ride hailing services has made life much easier, giving you hassle-free, upfront pricing as well as the opportunity to pay with credit cards. While I always felt save with drivers, having registered drivers and company oversights makes it even safer. Download & Sign-up: Download the grab app from the app store before your trip to Cambodia and sign up for an account. I’ve had issues with a US number, so I recommend signing up with an email address rather than a foreign phone number, as delivering the needed validation code to foreign numbers seems to be problematic! If you use my referral code GRABDREAMTRAVEL, you’ll get a discount on your first ride – and I do, too. Thanks for supporting the blog! 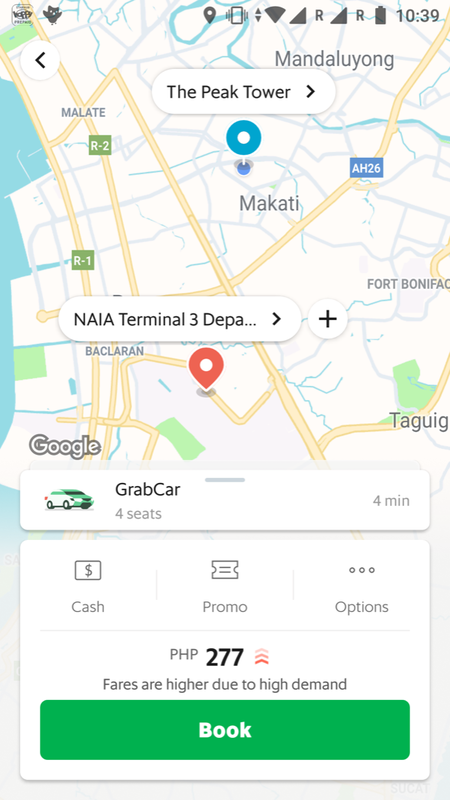 Payment: The default payment in grab is cash. While that’s necessary in cash oriented places like Cambodia, it’s less convenient. You can add a credit or debit card to make payments as well. Grab still has problems with accepting credit cards, so you might have to try with different cards. I haven’t been able to find a pattern of rejection, one of my cards worked on one phone, but not the next, so just keep trying till it is accepted. Grab will charge a small amount for each credit card you store, consider it a convenience fee! You can identify a card as “primary” or default payment, but the app is very unreliable: It frequently will revert back to cash as payment option, leaving you in the awkward situation of having to pay in cash when you were not planning on it! Make sure to check before booking each ride by clicking on the “cash” button to change it to your card. It should show a little “Visa” or other credit card logo instead! Ride Booking at Phnom Penh airport: At the airport, drivers won’t pick up at the terminal, only on the street in front of the airport. Before your hail a ride, exit the terminal and follow the signs to the road exit, it’s to the right when exiting, waling away from the terminal. It’s a short, five minute walk. A number of drivers wait by the side of the road and my request was accepted within seconds, so don’t request a ride till you are at the exit. You can select your destination by typing or on a map, and typical destinations like hotels will show up quickly. The next step is to select your car. grab in Cambodia has some fun options that reflect local transportation. 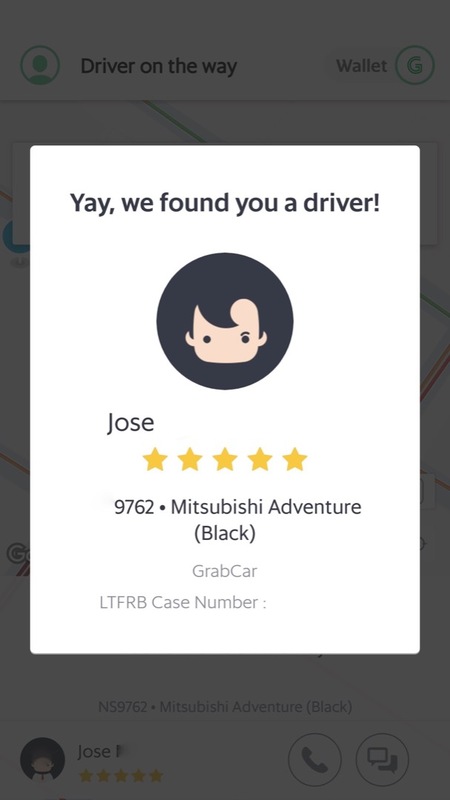 Similar to other ride hailing services, you can pick regular GrabCar, which are supposed to fit 4 people. 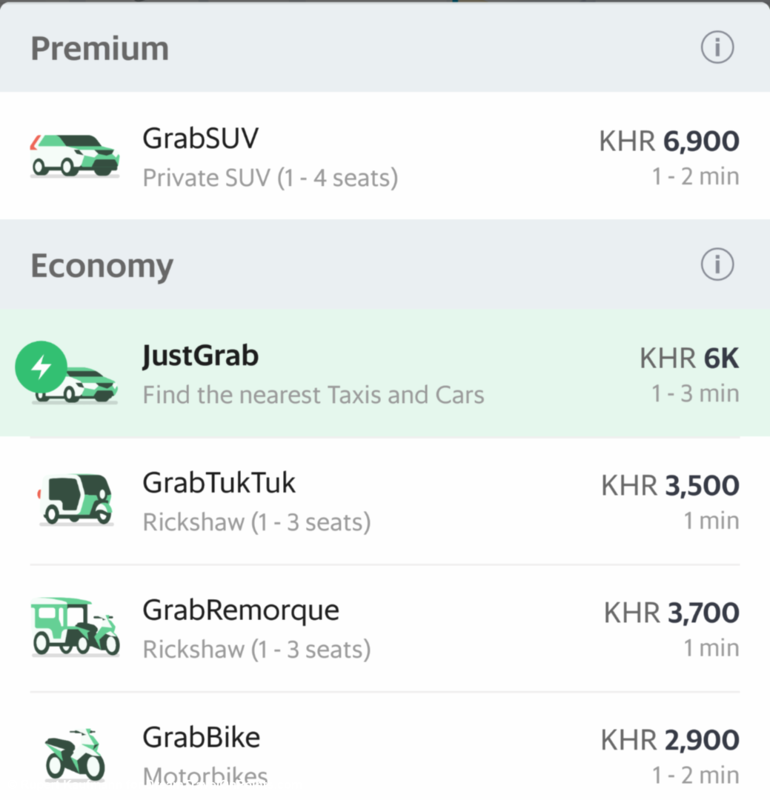 JustGrab will get you a GrabCar or a taxi, but in my experience usually a GrabCar. If you are a larger group, have multiple pieces of luggage or want a dash of luxury, you can upgrade to GrabSUV. 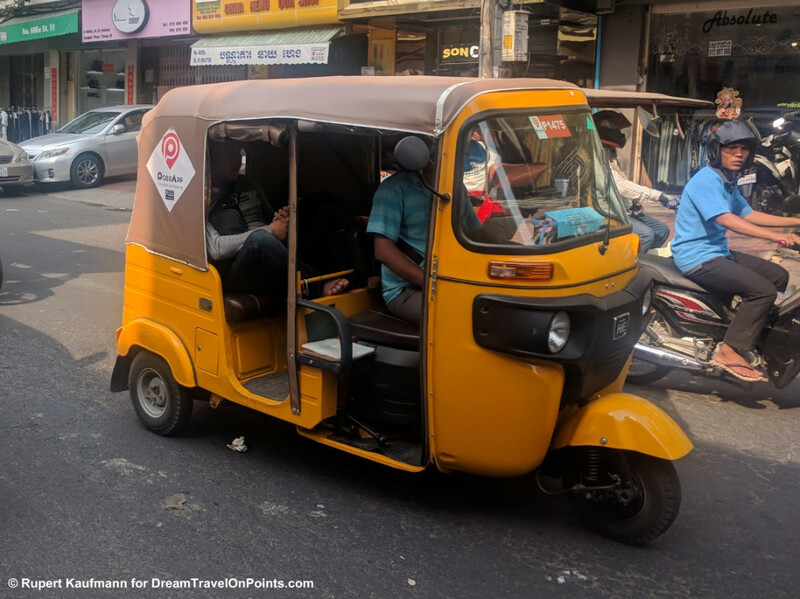 If you want to save some money, you can call a GrabTukTuk, which is a three-wheeled rikshaw as you see them in India. They are open air and offer space for 1-2 people with little luggage. GrabRemorque are carriages pulled by motorcycles and offer space for 1-3 people with space for luggage. They are also open-air and a little more than GrabTukTuk. Because the carriages have no breaks, I consider them the least safe. Both, remorque and rikshaw are fun around town, quicker than a car in traffic and worth a try, at least for a short ride! Around town, there are also GrabBike for a little less than a tuktuk, although I wouldn’t recommend to use it with luggage, regardless of what you see locals transport on a motorcyle! Similar to uber, grab has surge pricing during periods of high demand, marked by 3 red arrows pointing upwards next to the price! There seem to be a lot of drivers in Phnom Penh and Siem Reap and I never had surge pricing kick in. You can get a fare estimate with the grab fare calculator! My GrabCar from Phnom Penh airport to the city was $7 – roughly half what the fixed price airport taxis charge. A GrabTukTuk is just under $5 while negotiating it on the road will probably cost a foreigner around $7-9. Once a driver has been assigned, take a screenshot of the car, license plate and driver. grab’s app is unreliable and sometimes the ride information disappears, If that happens, go to History and check whether the ride is still in progress or has been cancelled. Text the driver where you are and/or use the GPS signal to find them along the road. The Ride: Once you have met your driver and are departing, the app should indicate In Transit. The drivers generally will follow the navigation, but experienced locals might take side streets to get around the heavy traffic, so don’t worry – trust them, they are professionals! At the end of the drive, wait for the driver to end the ride. grab allows drivers to enter tolls or extras manually, so make sure your receipt shows what you were quoted. I had once in Phnom Penh and once in Siem Reap drivers accept a ride, but than changing their mind and not wanting to pick up. If that happens, ask them to cancel. If they don’t and just keep driving, you can cancel the ride, provide feedback via the app and request a new ride. grab doesn’t charge you for the cancellation, but limits the number of times you cancel in a period of time to avoid abuse. If there was a problem with the ride, you can report it through the app. grab in Siem Reap: grab in Siem Reap is very similar. Rides between the airport and town are about $10 – that’s the same you can get from a regular driver at the airport, so no saving here. A remorque will be approx. 40% less and a tuktuk 60%. Bottomline: grab worked well for me in Phom Penh and Siem Reap and takes the hassle out of getting around. Transport is cheap with most rides around town just $1-3. Compared to local competitor PassApp, grab is more convenient, because it allows credit card payment and you don’t need the local currency Riel for small amounts. It’s a reliable and safe ride from Phnom Penh airport to the city or around Phom Penh as well as in Siem Reap. I recommend to download the app, sign-up and not worry about taxi scams. Use my referral code GRABDREAMTRAVEL for a discount on your first ride (and my next one – thanks!). 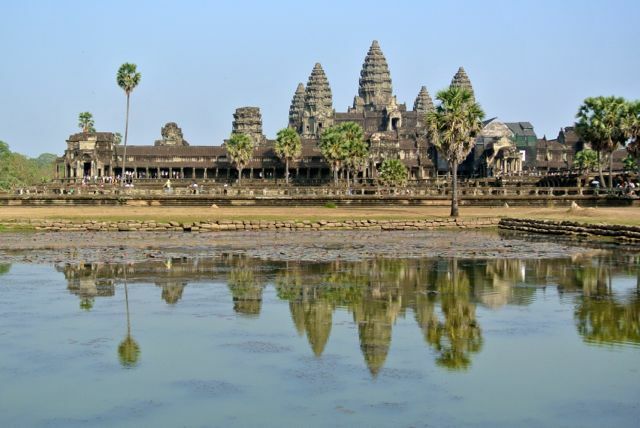 Now, you can plan your trip to Cambodia. Check out my Guide Phnom Penh and Guide Siem Reap for tips where to stay, what to see & do, where to eat and how to get around!